Whilst in the Philippines, Kat and Christian first met when attending escape room adventure. From there, their love blossomed. Two years later, Christian got down one one knee on a European adventure, in a way that was least expected. "I kept thinking he was going to propose in every city we were in. It finally happened in Venice, our last night, in our hotel room, with both of us in our PJ's. I wouldn't want it any other way. It was private, meaningful and just us" Kat explained. Prior to being wed, the couple combined cultures for a vibrant welcome dinner with guests in the Stone House of Tirtha Bridal. A blend of Bollywood and Balinese cultures inspired the theme, which the couple nicknamed 'Bali-wood'. The bride dressed in a warm toned gagra choli, a traditional combination of a long skirt and blouse. The groom looked dapper in a sherwani, a long coat-like garment traditionally worn as a wedding outfit. Bright and bold colours were scattered throughout pre wedding celebrations, with fresh flowers creating a background of vibrance and liveliness. The evening was completed with traditional dances and was filled with a rich variety of both Balinese and Indian cuisines. When envisioning her special day, Kat dreamed of a wedding dress that embodied romance and love. Choosing Israeli designer Inbal Dror for her bridal look, Kat loved the sensual style instilled in the gown. With a lace overlay and rich chocolate champagne tone, the gown was the perfect balance of chic and unique. The look was completed with a delightful bouquet of soft white orchids. Christian opted for a rich forest green velvet tuxedo, giving the ultimate contemporary twist on a traditional style garment. The bridal party consisted of two best men and three maids of honour. Christian's brothers stood by his side in pastel blue suits, while Kat's sister and two friends wowed in uniquely designed gold and floral combinations. Bouquets added a final delicate detail to the day with the baby's breath tying together with the overall aesthetic. 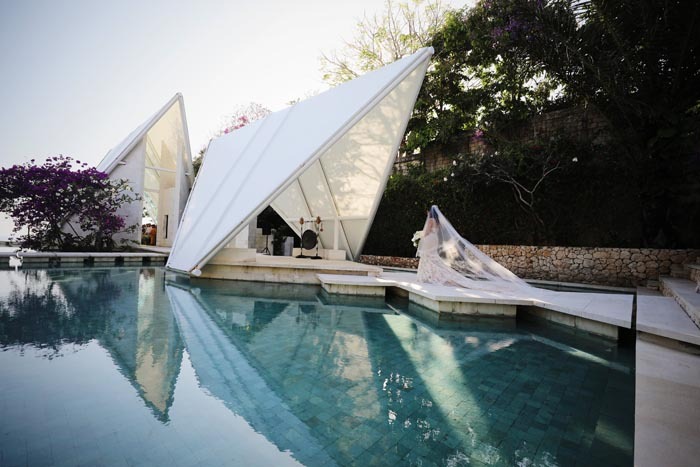 With sweeping views of the Indian Ocean the couple wed in the iconic Glass Chapel at Tirtha Bridal, Uluwatu surrounded by an intimate party of 80 of their closest family and friends. The reception took place in The Glass House of Tirtha Bridal, with beautiful details from beginning to end. The couple coined the reception as a 'white affair', with a colour palette of which tones, soft greenery, simple floral elements and a touch of sparkle. "I wanted a contrast to the bali-wood colourful theme from the welcome dinner, something more elegant. Focusing more on white colours and greenery, babies breath and simply flowers", Kat reveals. Tables were decorated with simple blooms and muted tones, set against against a white backdrop. The event was beautifully lit with hanging chandeliers, each soft in detail and sparkle. Clear baubles dangled from the roof filled with beautiful babies breath. Finally, floating candles were placed throughout the outdoor pools, carrying a beautiful glow around the venue. Taking advantage of the breathtaking sunset overlooking the ocean, guests enjoyed a cocktail hour after the ceremony. From here, the venue offered guests a decadent four course meal paired with wonderful wines to match. The opulent display was hosted by the venue's two time award winning sommelier, Daisuke Kawai. The evening concluded with a white based naked style cake, decorated with rustic greenery and tops with glazed donuts. Finishing up this glorious celebration in style, Kat surprised guests with a musical performance. Christian explained "one of the most memorable moments was when Kat sang and played the Ukulele. It was a surprise that only a few people knew about. She had been secretly taking lessons for four months". A singer himself, Christian later performed for guests as well. Talk about a talented couple! Wanting to carry on their multicultural theme, the couple gifted guests with a Balinese gift. Traditionally woven baskets were created and filled with Balinese coffee, mosquito repellent and traditional Balinese chocolate. Having planned a stunning celebration of love, the couple had plenty of wonderful advice to share! "Pick wedding coordinators that match your wedding planning style, they are the most important vendors you will hire. Pick a venue that you love, we were so lucky to find Tirtha. They understood exactly what we wanted and executed everything beyond our expectations." You can check out Kat and Christian's beautiful wedding video here! Get the tissues ready, this one is a real tearjerker!